for Backstories, extras, videos, music or the era, and much more! Sol and Hilda play together. In the Frankfurt Sinfonietta to be exact, and Sol loves Hilda and Hilda loves Sol. So what? Well… Hilda’s father is a Nazi chief on his way to becoming a camp Commandant, and Sol is of course… A Jew, the heir to the Goldberg family Torah, and a young man at odds with his own religion. Taking her word to its limit, Sol relinquishes his roots, his love, his art, his baby sister Anya, and his humanity, to stay out of the tireless Nazi furnaces. Can Hilda, by herself becoming a Jew, find him and Anya and save them from the jaws of hell? Or has Sol already entered and made himself… at home? “Brown’s theatricality is phenomenally detailed and fluid, leaving no awkward joins. Denouements are of the finest. There’s a scent of Arthur Miller in family journey. Shocks – several extraordinary – force questions of the play’s title. 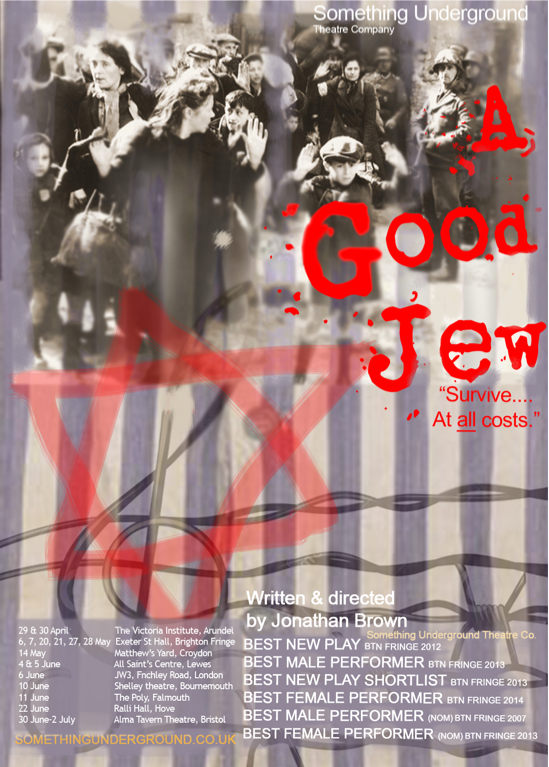 “A Good Jew was never going to be an easy evening’s entertainment, but little did we know just how riveting and disturbing a piece of theatre it would prove to be.” The Fine Times Recorder. “We thought the production was very high quality …. such a moving piece of drama. The cast were brilliant and in particular Isabella was superbly cast as Hilda bringing both determination and vulnerability to the role. The mother and son scene …. was the most powerful piece of drama I have seen in a very long time. I thought the way in which the propaganda pieces were depicted was ingenious and chilling. In short, we thought it was a brilliant and powerful depiction of well known historical events told in an inventive and very personal way. 1938. Sol is the pianist big brother, heir to the ancient Family Torah, all 304,805 handwritten characters of it, and Anya is his talented little sister. Together they live with their mother Martha, in prewar Frankfurt. And Sol is in love. With Hilda, violinist in the same orchestra, and daughter of local Nazi chief Klaus Brandt. But life for Martha and her Frankfurt family is about to change. With life for Jews already harsh, the assassination of the German ambassador in Paris by a Jewish activist is enough for Hitler to unleash his SS attack dogs on Jews across the country. The November Progrom, Kristallnacht, is followed by deportations, expropriation of Jewish-owned properties and further tightening of anti-Jewish laws. As the war takes hold of Germany, both Sol and Hilda must make terrible choices. Sol has fake Aryan papers, but to really pass as a Good German he must demonstrate, in chilling form, his loyalty to the Reich. Hilda, defies her father and switches identity to a Jew, to go in search of Sol whom she assumes deported. Martha and Anya are meanwhile separated and we don’t know if we’ll ever see any of them again. Finally, in Czechoslovakia, at a concentration camp at Theresienstadt, where many of Germany’s best Jewish artists have been corralled, strange reunions take place, and darkly-surreal artworks are commissioned. As secret identities, propaganda and deceptions run deep in the Nazi system, so it also runs through the network of those who would survive the killing machine. We have been supported hugely in this project by over 30 Crowdfund Campaign backers. Click here to see who these lovely people were! Some donated directly, such as Diana Moon, Derek W, and a hefty host of young people who sponsored Luci directly. Big thanks to that excellent collection of good friends. Brighton Unemployed Centre Families Project for immense support with rehearsal space. Pippa Randall for prop and costume support, occasional technical operation & chaparoning. Britt Forsberg for directing support on our last vignette. Substantial (£50 or more) Crowdfunding Backers Diana Moon, Philip Ayckbourn, Russell Gates and one anonymous. JW3 who allowed us to develop the play through a staged reading, November 2015. Aubrey Smith for loan of Telephone. Wayne for loan of costume items. Robbie and Roy Randall for support for Luci. Imogen Senter for Tech Operation, Bristol. Gladrags Community Costumes in Brighton for costume hire and advice. Isabella McCarthy Sommerville for additional media liaison.